I have a few spots on the Hourglass quilt which need to be stitched down, then it’s ready to be washed. I’m doing temporary labels for the show, so I’ll put the label on after it comes out of the dryer. I have the strips sewn together for the binding of En Provence, but it’s not been pressed. I hope to get it on tonight so I can wash it tomorrow before the guild meeting. It was a long day today. I left my house about 9:45. I started off running to the store for a twin batt. Stopped in at the Guild Sew Day, dropping off items for the guild boutique and trimmed my En Provence on the floor where I could lay it out flat! I headed north stopped by a friends, then since there was a quilt store near by dropped in there before heading south towards my sisters. Stopped in at a third shop to pick up a ruler. It was about 2 when I finally got to my sister’s to use the longarm and it was close to 9:30 before I was finished. I’m making progress on the quilts for the quilt show. About a month ago, my sister took possession of an Innova Long Arm with Mach 3. Mach 3 is the computer. 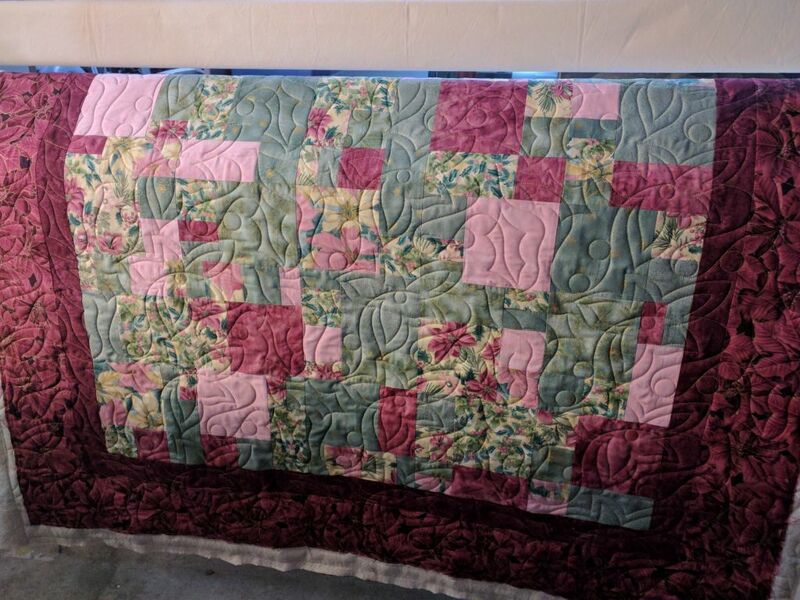 Anyway, since she got it, I’ve quilted the two pastel rail fence quilts, the black and white Strip Twist and my Christmas En Provence. Only the Strip Twist is bound, the rest still need binding. Since my sister is off at a quilt retreat this weekend, she said I could use the long arm. So, off I went with this Christmas Crazy 8 which has been a top for a bit over 12 years (I finished it 9/1/06 according to my notes). I managed to upload the digital pantograph I bought – Echo Holly by Dave Hudson for Urban Elementz. I was able to tell the computer what Size I wanted it to stitch out at get it to stitch. I ran into one snag where the thread broke – it got caught on the back handles – I have no idea how that happened. Then the last 2 1/2 row gave me grief. 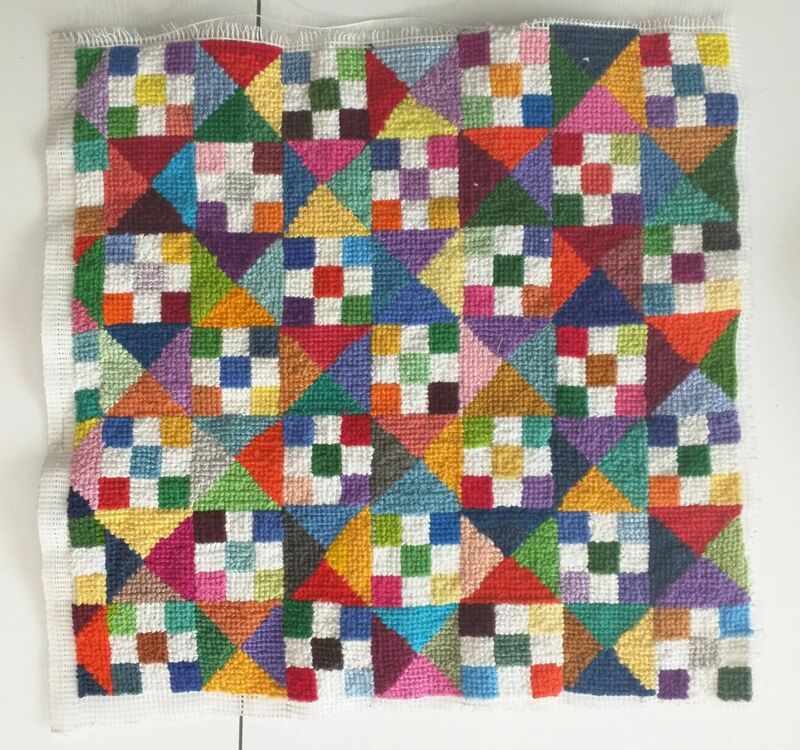 I’ve about decided I linked them in the wrong order as it stitched out the bottom row, then the next to bottom row and finally the 2nd full row from the end. But, even with that oddness, I’m very happy with how it stitched out. So, now I have 4 quilts ready to bind for the quilt show. 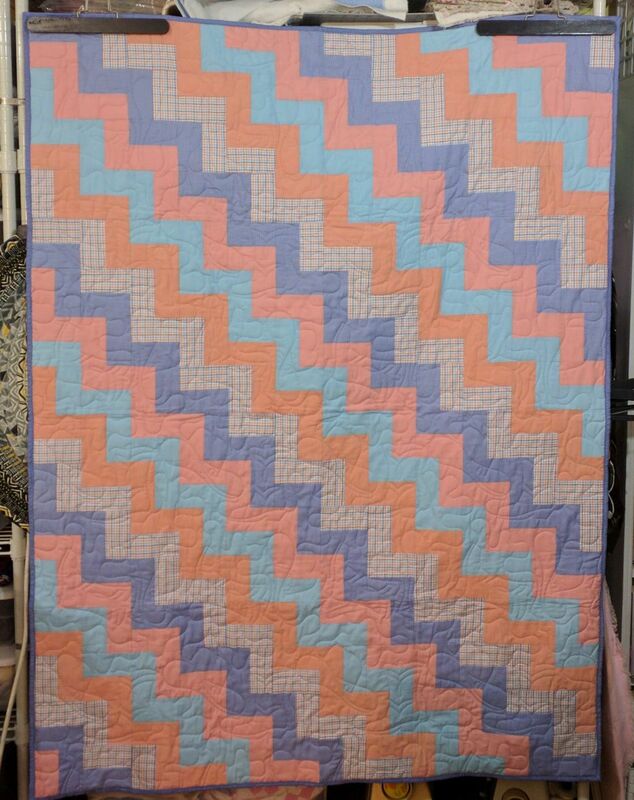 The hourglass quilt is one round of hour glasses and the border away from being ready to quilt. The plan is to finish it up tomorrow and go back over to my sister’s to quilt it. Last night I attended an auction. The ad that my husband saw on one of his social media accounts had a guitar featured. 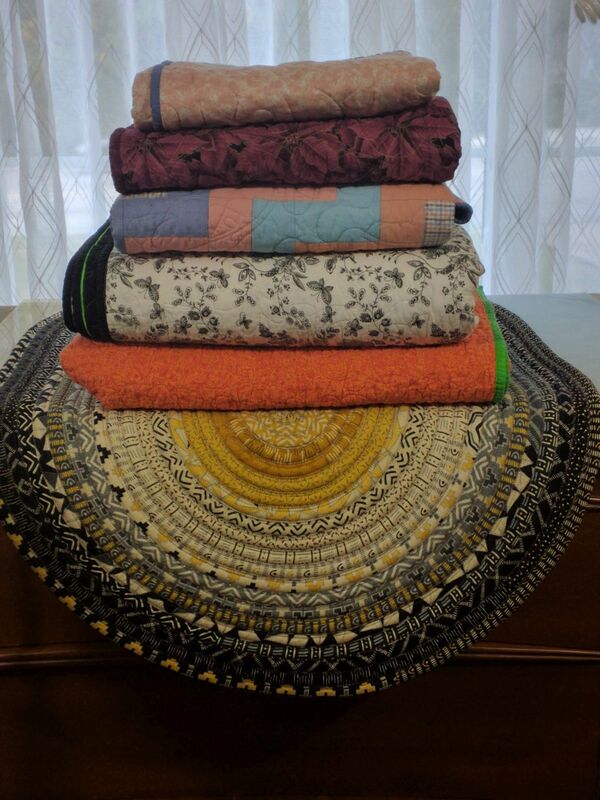 When he saw a quilt, he sent it to me, then we found fabric and more fabric. 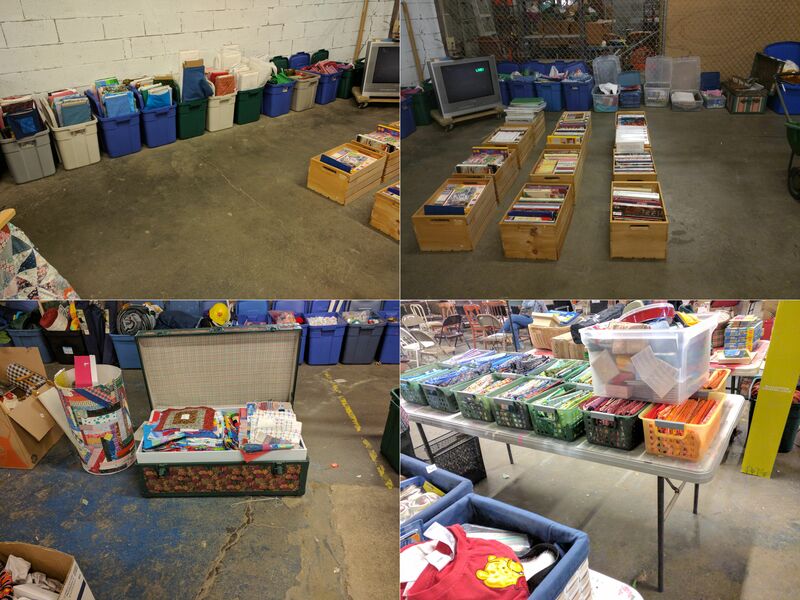 The top picture was just part of what was on that side of the warehouse — there were bins of notions on that side as well. On the other side of the warehouse were more of the “pre-cuts”. 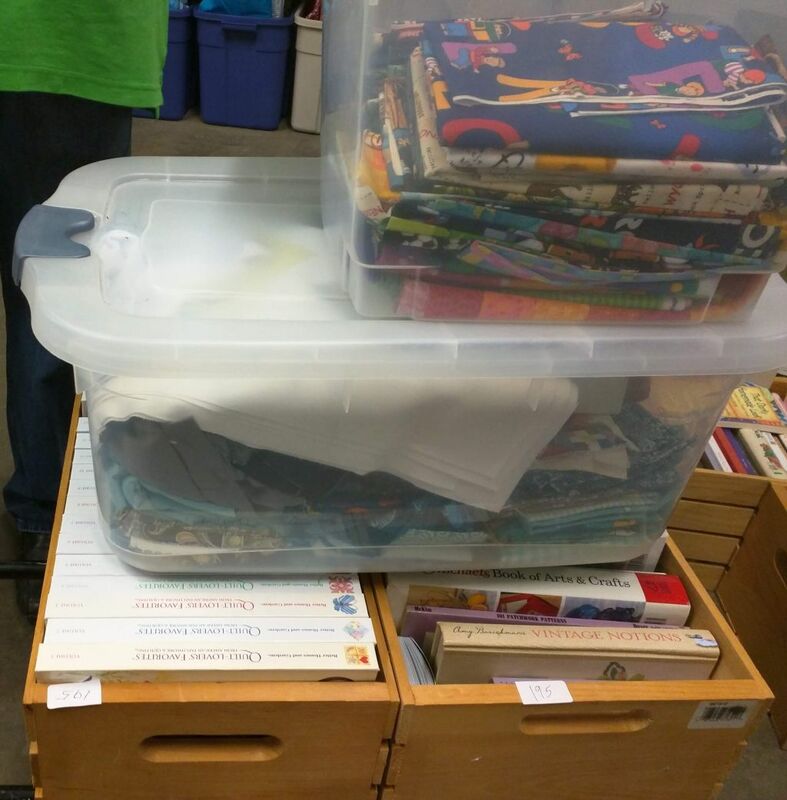 I really wanted the boxes of 6″ squares and 2″ squares, but I was on a limited budget and was conservative spending my sister’s money as well. The photo boxes went anywhere from $17 to $30 dollars. Very accurate cutting, well worth the value – but not having space or a plan I skipped those. 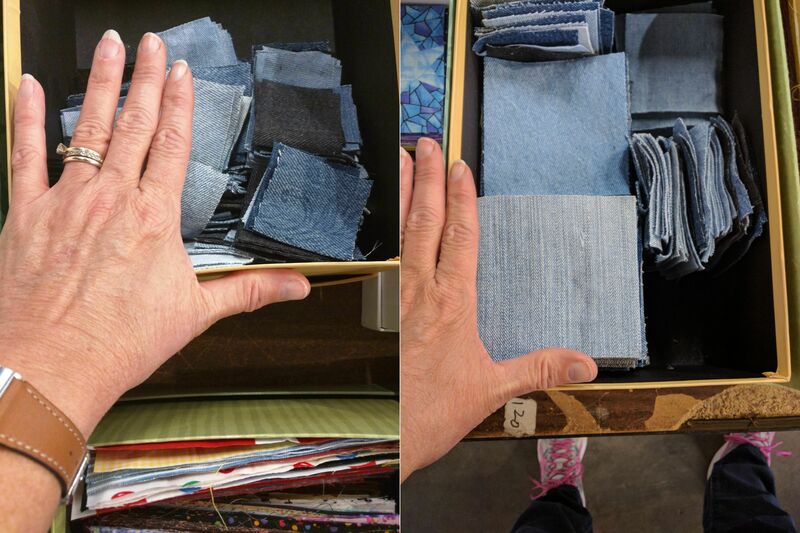 Besides, there was a sewing table and the fabric and books on the other side of the warehouse that I was interested in. The fabric covered foot locker had quilt blocks and tops it quickly went out of my price range as did the round bin. What you don’t see is that it had several rulers in it, including a 6 x 24 Olfa ruler. But I was waiting for those color sorted bins. The first 9 went for either $45 or $65 EACH! The last 5 were either $25 or $45 each — way more that I was willing to spend. I did get the sewing table for my sister. This is a screen shot from the auction house preview pics. The big blue bins went for $45 – $60. More than I was willing to spend – but in some instances well worth the money. Those crates have quilting books in them. The first box went for $20. It was most of the books from the Better Homes and Gardens Quilt-Lovers’ Favorites collection. After that, the crates of books went for $10 – I discovered two more books in a second crate. I have no idea what else is in that crate as I didn’t look closer and it’s still in the car. The bottom box was a weird mix. I was after the turquoise fabric. My sister has someone she’s planning on giving the denim to. There was also a Pop-Tart t-shirt, micro fiber glass cloths, a polyester gray curtain and this quilt themed needlepoint. 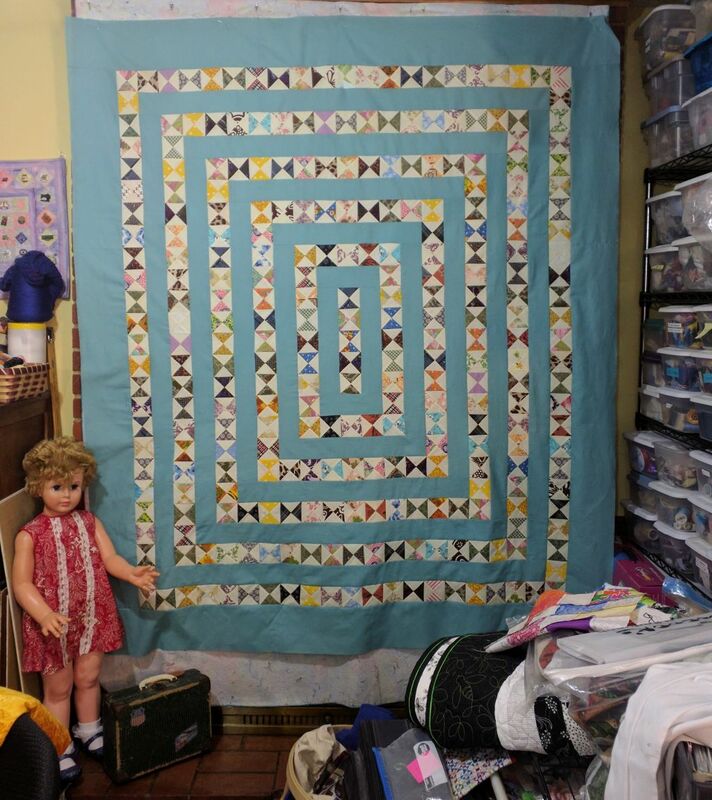 I want to figure out how to finish this to hang in my sewing space. All in all a fun evening. 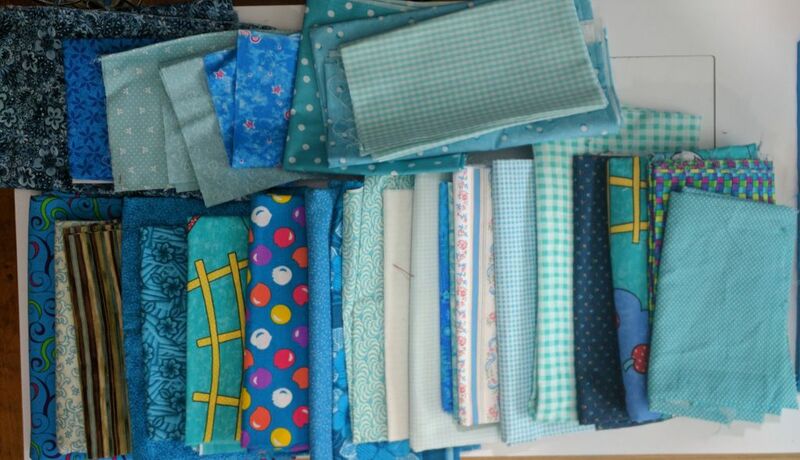 I think I did well on my quilting purchases and probably over spent on my non-quilting purchases, but in the end I still didn’t spend too much. What I’ve been up to? Well the sewing room/office is getting there. Boxes are still stacked in the living room, dining room and my space. Some definitely go to the basement, some definitely come back into my space and some still need to be gone through. But the good news is I can get to both of my computers (work and home), I have a lap top hooked up to a television for watching DVDs, my ironing board is doing dual duty as my cutting table and most importantly I can get to my sewing machine. 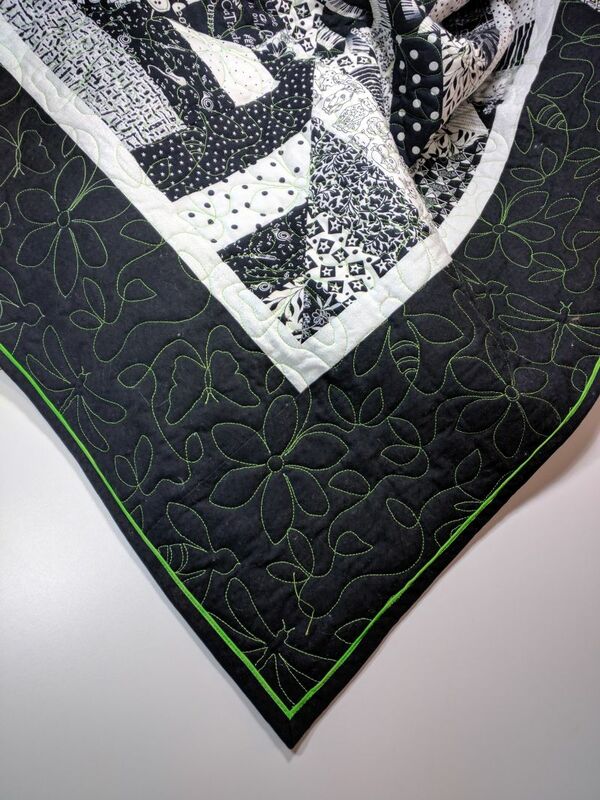 Last weekend I got the binding on the black and white Strip Twist quilt. I still need to bury some threads and wash it, then it will be ready for it’s official portrait. 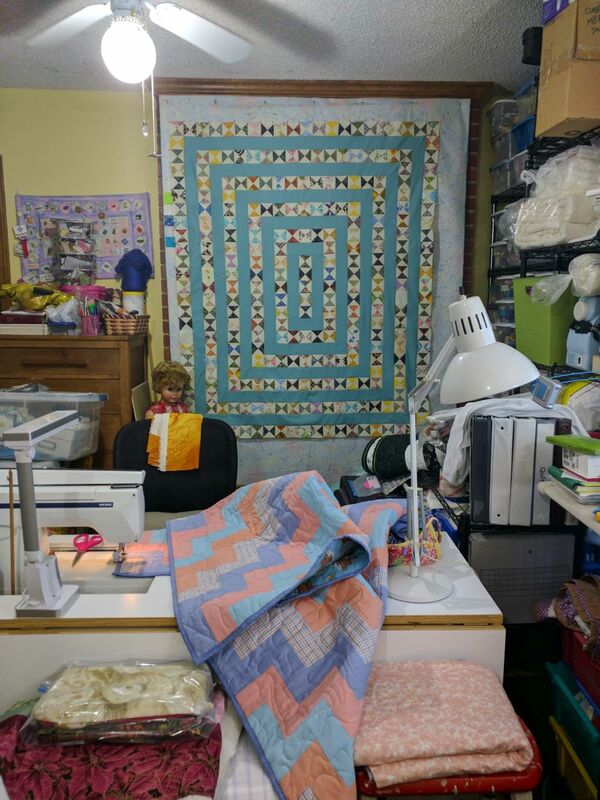 Meanwhile the two pastel rail fence quilts are still waiting to be bound. I’ve got to figure out which box the shirts ended up in. There are two dark blue houndstooth shirts I’m going to cut up for binding. 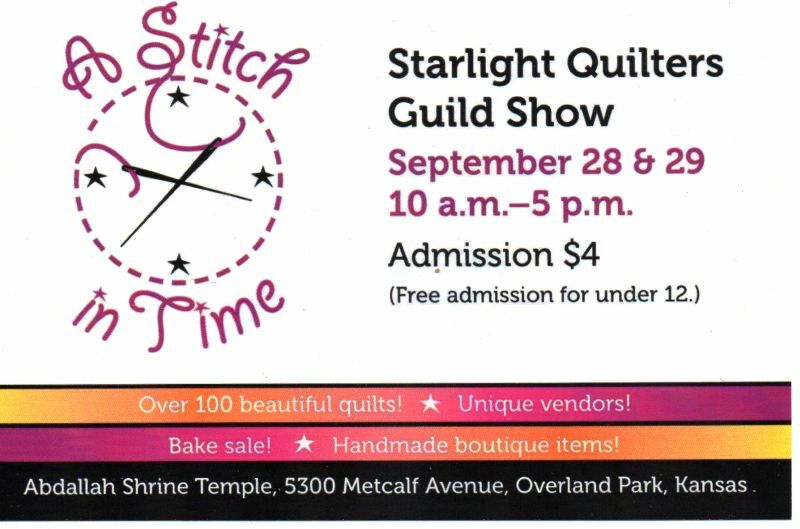 But meanwhile, I’ve turned in paperwork for 5 quilts to hang in the guild quilt show at the end of the month and they need to be prepped. Who am I kidding — I need to finish them. Gift Wrapped. It needs to be washed again and a new label made for it. It has a sleeve. 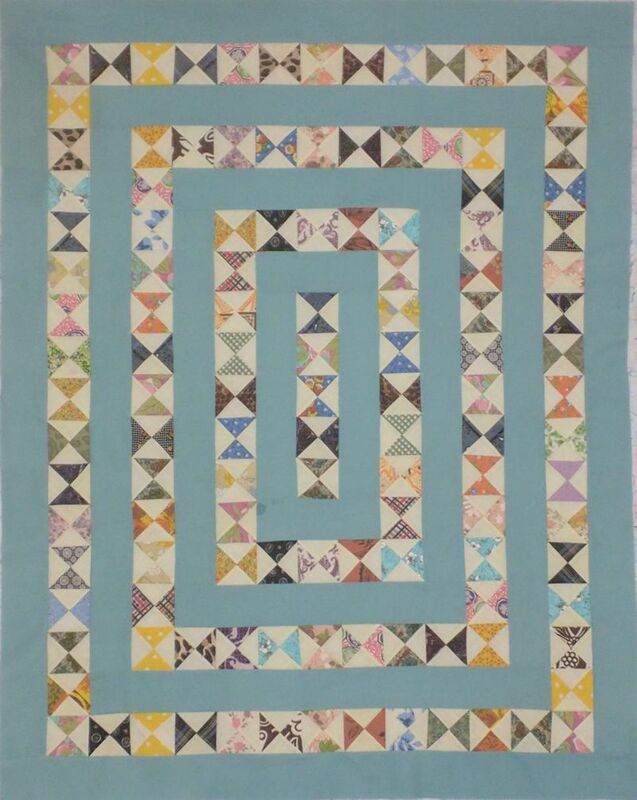 Jelly Roll Rug – I need to get a temporary label and possibly hanging sleeve on it. En Provence. It’s been quilted, but needs binding, a label, sleeve and washing. Christmas Crazy Eight. – Needs to be quilted, bound, label, sleeve and washing. 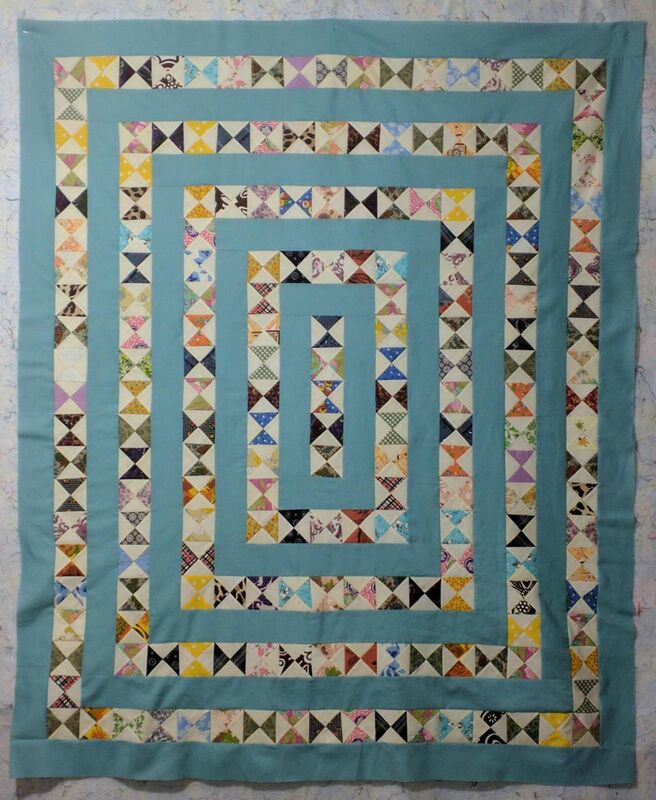 Vintage Hourglasses – I’m still piecing this one. Here’s where I am on the hourglass quilt. I still have to add 2 more rounds of hourglasses, then I have to figure out how I’m going to quilt it. I need to quilt it somewhat close as most of the hourglass blocks have a very narrow seam allowance where they join together. The good news is they are all bias edges, so the blocks are not raveling. I also want to evoke a vintage feel. After my office was painted, which I think was about 10 years ago, I put up white temporary paper shades on the window. They were ugly, but effective. 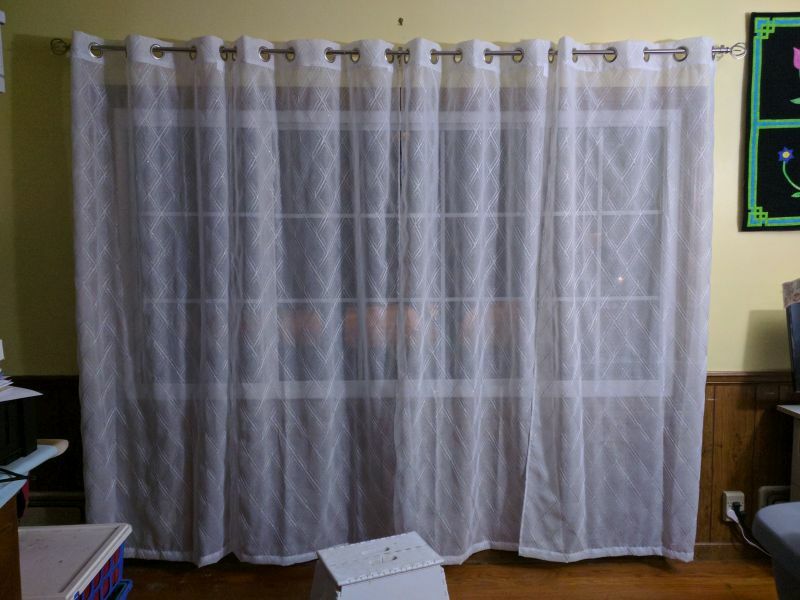 Now that I have a new window and I’m shuffling my space around, it’s time to do something about those window coverings. My first thought was mini blinds. But at 93″ wide, with a center section of 44″ and no way to do an inside mount, another option was needed. 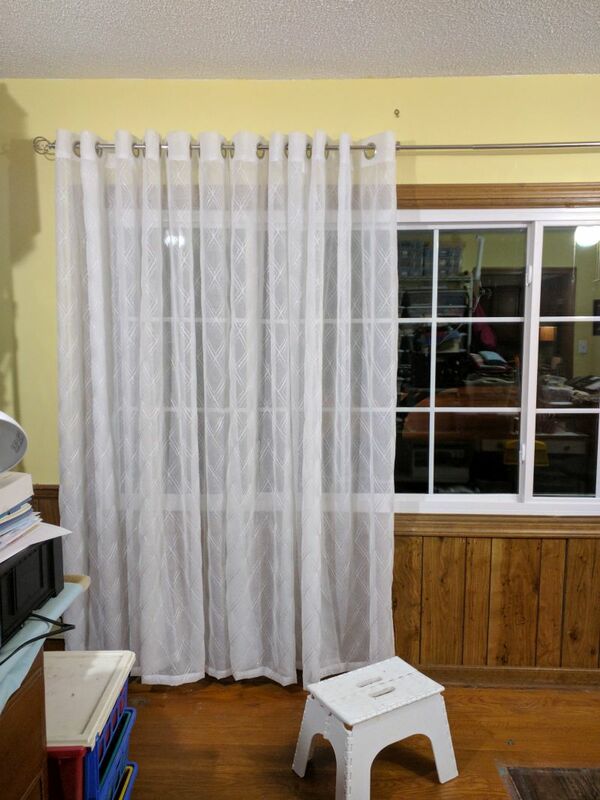 We spotted these sheers and snagged 2 sets. But when I got them up I knew I needed at least one more set, maybe 2. So, back to the store I went only they had sold them all. When I got home I put all of them over on one side and decided I needed 2 more sets and ordered them on-line. Eventually I may decide I need to special order some blinds, but in the meantime I simply won’t pass through the room unless I’m dressed. As for the furniture, it is still a work in progress. I need to put my large file cabinet on wheels so I can put it in the corner and have the various internet cables run under it. Also I need to switch sides for my work and personal computer so I can reach the phone while I’m working. When I switch the file cabinets I’ll move the lamp as well. Oh, if you go back and look at what I was planning before, this is not where the desk was going to be. But that was before realized I wasn’t going to be able to make just one file cabinet work. 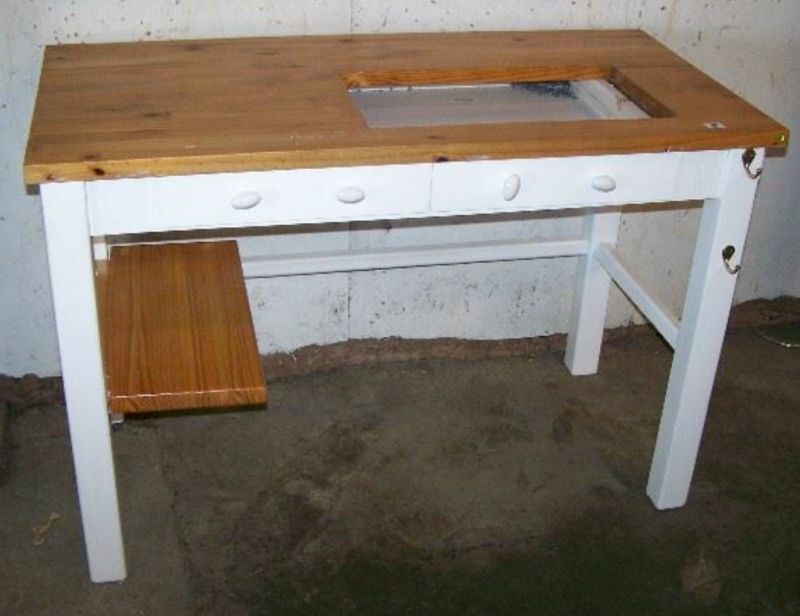 So, now the plan is to put the cutting table up against the window and set the sewing table galley style opposite of the desk. Maybe. 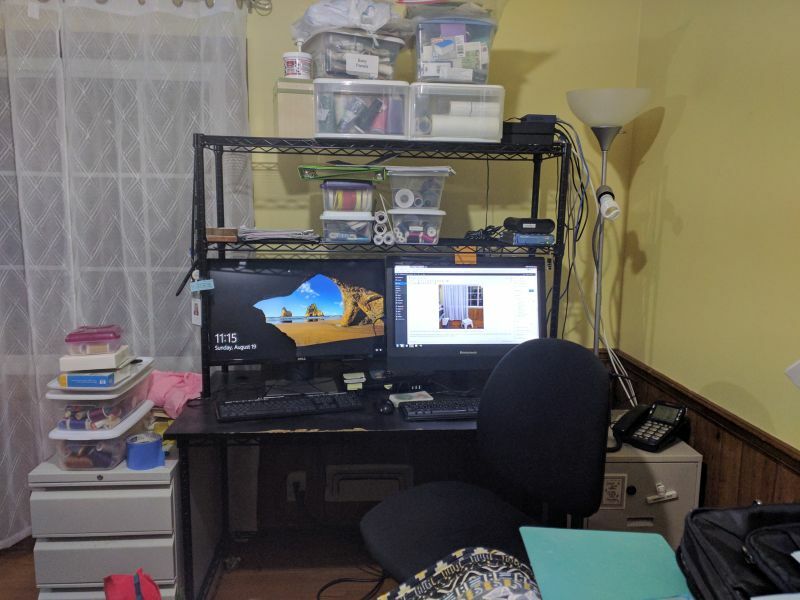 I’ve got the desk about 5″ from the wall to accommodate the curtains and that 5″ is turning out to be critical with 2 chairs. My sewing chair is too low for my desk and the desk chair is too high for the sewing machine. Add in that now my back is to the window and now I am back to the drawing board. 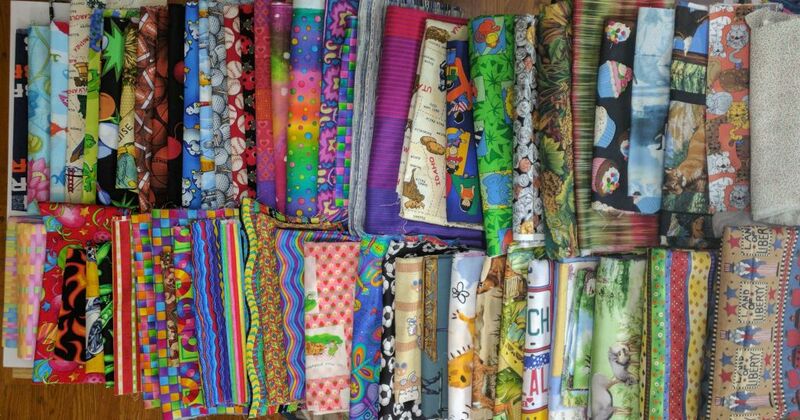 All I know for certain is that I am missing not being able to sew.